Having a social media audience allows you to boost your social proof and get more blog traffic. Twitter is still a major source of this blog’s traffic, and having my large Twitter audience also boosts my credibility. It is on Twitter where I grow strong relationships with my readers. I have had dozens of conversations with some of the same readers. Having a strong social media audience gives you a platform to promote your content on the web and good SEO at the same time. SEO is an important part of a blog’s success, but if you focus on being successful on social media, then you will have successful SEO (that’s why SEO did not make this list). My advice for mastering social networks is to master one social network at a time. If you try to master all of the major social networks at once, you will get confused by information overload. Approaching one social network at a time will make the information easier to obtain and remember. It is better to be effective on one social network than it is to be mediocre on 10 social networks. Your email list is another powerful source of blog traffic. It is on your email list where you can generate a large income by promoting your products and building relationships with your readers. Most of the emails you send to your subscribers should promote your latest articles. You should only do a product pitch to your subscribers once every six weeks. However, it is also important to avoid doing a product pitch just for the sake of doing a product pitch. If you have nothing new to sell or don’t have a special deal for the old stuff, then there is no reason to promote a product to your email list. Remember that promoting your blog posts and engaging with your email subscribers builds the relationships, not product pitch after product pitch. Traffic is primarily generated through social media, an email list, and SEO. You can achieve good SEO by growing your social media audience and getting the people on your email list to visit and share your blog posts. Directory sites such as StumbleUpon and Digg are great places to get additional traffic, but you should primarily focus on your social media audience, email list, and SEO. Your products are your primary sources of income. Advertisements are not worth the time and effort (they lead people away from your blog), and in affiliate marketing, you are dependent on good commissions and other marketers/brands. By creating your own products, you will have a more stable income. If the person you are affiliated with decides to go down from a 10% commission per affiliate sale to a 5% commission per affiliate sale, then you’ll get half the initial commission per sale. When you create your own products, you have more control over the commission you get, and the commissions tend to be higher. When I write a $2.99 Kindle book, I make 70% of the commission. However, if I was not the author and promoted the book as an Amazon Associate, I would only get a 4% commission. It would take 18 sales as an Amazon Associate to make the same revenue as the author who generates one sale for the same book. The numbers support creating your own products. The content you provide on your blog can either attract loyal readers or scare people away. No matter how much social proof you have, that social proof can only take you so far. The restaurant with a packed parking lot has more social proof than the restaurant with no visitors. However, if the food at the popular restaurant tastes awful, customers won’t come back. Then, that social proof will gradually disappear and the restaurant will become irrelevant. The content you provide on your blog must give your readers a reason to stick around and come back. There are numerous blogs on the web that provide valuable content. My blog is not the only digital marketing blog on the web, and your blog is not the only blog of its kind on the web either. Providing valuable content will allow you to stand out from the crowd, and as a result, get more returning visitors. The returning visitors are the ones who promote your content, join your email list, and buy your products. The main reason most people are not successful is because they make success more complicated than it has to be. A blog’s success is not a combination of dozens of methods working together. 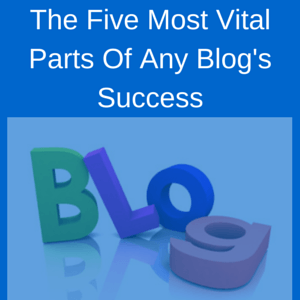 Instead, a blog’s success is a combination of those five vital parts. By focusing on these five methods instead of the dozens of methods that are available, you will move closer to successful blogging. Which of these methods was your favorite? Do you have any tips on amplifying these five methods? Please share your thoughts and advice below.